LONDON--(BUSINESS WIRE)--Technavio has announced its latest pipeline analysis report on the rickets market. The report includes a detailed analysis of the pipeline molecules under investigation within the defined data collection period to treat rickets. This report presents a detailed analysis of the market, including regulatory framework, drug development strategies, recruitment strategies, and key companies that are expected to play an essential role in the growth of the market in the coming years. Rickets is a skeletal disorder that occurs because of the deficiency of vitamin D, calcium, or phosphate. These are the essential nutrients for the development of strong and healthy bones. People suffering from rickets usually have weak and soft bones, stunted growth, and in severe cases, skeletal deformities. 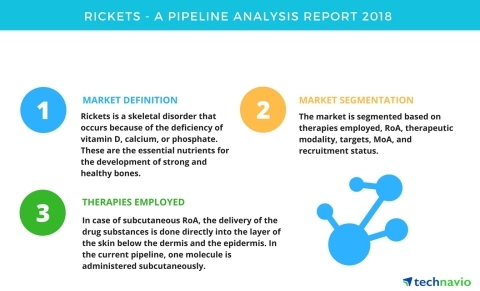 This market research report segments the rickets market based on therapies employed including monotherapy, RoA (subcutaneous and unknown), therapeutic modalities (enzyme and monoclonal antibody), targets for drugs under development (FGF23 and ENPP1), MoA (ENPP1 and FGF23 inhibitor), and recruitment status (active not recruiting and NA). In the case of subcutaneous RoA, the delivery of the drug substances is done directly into the layer of the skin below the dermis and the epidermis. In the current pipeline, one molecule is administered subcutaneously. Enzymes are biological molecules that substantially speed up the rate of virtually all of the chemical reactions that take place within the cell. About 50% of the molecules in the current pipeline are enzymes. Technavio has published a new report on the drug development pipeline for rickets, including a detailed study of the pipeline molecules.